Barcodes are machine-readable patterns that we see in most packaging for certain items. Especially today, when mass production is everywhere, barcodes are a big help to ease the production process. The data contained within barcodes allow users to identify, inform, or can even be used for marketing purposes. We see such images on the streets nowadays. QR-codes are used to market the company’s products, barcodes on all products we purchase; every one contains a lot of information. Have you ever wondered why there are so many different types, and why they are used in that instance? Don’t be afraid to say that you do not really know much about barcodes or data capture technology. Most of us know barcodes from their experience in retail shopping where the linear barcodes stated on the item purchased will capture the correct pricing when it goes through the scanner. Barcodes are more than just that. It is an impressive solution to workflow headaches and process slowdowns, and provides big data answers enterprise-wide. Each barcode provides real-time information, and it plays an important role in businesses. With over 40 different barcode types out there, each with a specific purpose, it can be a little confusing how to differentiate and understand each purpose. Before we look at the different barcodes, you need to know that there are 2 main categories for barcodes, One-Dimensional (1D) and Two-Dimensional (2D) barcodes. 1D barcodes are called linear because the information placed is in a linear line, holding a dozen numeric or alphanumeric characters, represented by this spacing of parallel vertical lines. The entire barcode needs to fit within the reader’s range to decode. They are found commonly on consumer goods. 2D barcodes are omnidirectional, and are able to contain large amounts of data both vertically and horizontally. Information is in matrix style and is highly secured. This type of barcode requires more sophisticated decoding software. Code 128: This type of barcode is typically used in logistics, transportation and shipping industries. Code 128 is a versatile, high-density, variable-length barcode that can store diversified information as they can support letters, numbers and a variety of other ASCII characters. It complies with International Standard ISO/IEC 15417. Codabar: Codabar is able to contain limited characters/numbers/symbols. It is an out-dated type of barcode used mainly in libraries, blood banks and overnight packaging industries. The main benefit is that it is easy to print and highly tolerant of minor printing imperfections. EAN13: Worldwide usage in retail goods marking, and comply to International Standard ISO/IEC 15420. It encodes 13 characters, with the first 2 or 3 being country codes where the manufacturer is registered. EAN-8: It is a shortened version of the EAN-13 code. It includes a 2 or 3 digit country code. The data digits in an EAN-8 symbol specifically identify a particular product and manufacturer. Since a limited number of EAN-8 codes are available in each country, they are issued only for products with insufficient space for a normal EAN-13 symbol. For example, a 2-digit country code permits a total of only 100,000 item numbers. UPC-A: UPC stands for Universal Product Code. It is used for worldwide retail, and complies with International Standard ISO/IEC 15420. It identifies the manufacturer, and specific products, so that the register systems can automatically find the prices. QR-Code: A matrix code that allows encoding of different characters, URL, music and images. This is frequently used to be scanned with smartphones. After knowing the different types of barcodes, it is important to have a solution that can read and decode the information. Have you met cases where the barcode readers cannot capture the data, when barcodes are damaged, tiny, rubbed off or torn? Phoenix Contact printing software allows you to print all the different barcodes, and the best part is… It is free! At the same time, you do not have to worry about the printing process as Phoenix Contact printers ensure you have a seamless, clear printing process. Additionally, we assure you that as with all our prints, they are scratch proof, water proof, oil and chemical resistant! You will always have readable barcodes! With the implementation of large scale solar projects in Malaysia, there are more and more inquiries on special marking materials for cable marking, equipment marking, and plant marking that can withstand long hours of sunlight and harsh environments. If you ever come across such a request from the project consultants or clients, Phoenix Contact marking materials are what you are looking for. We have various product offers that are UV-resistant and weather resistant, ranging from stainless steel to aluminium to high-quality thermoplastic polyether urethane. Here are two examples of solar cable markers with different types of printing methods. Phoenix Contact LS-WMTB product range is available in stainless steel (V4A) or aluminium. It provides simple and fast installation with cable binders. This marker is suitable for the most demanding industrial requirements because it not only fulfils the harsh requirement in the solar industry, but it can also be applied in areas that require high resistance against salt water, chloride, and solvents. With the use of modern laser technology, it creates highly resistant and permanent markings on these markers. Phoenix Contact WMTB HF range of product is suitable for both indoor and outdoor applications. It is made of high-quality thermoplastic polyether urethane, halogen-free and flame-retardant material, with high tensile strength that is able to adapt to the bending of the cable conductors. WMTB HF comes with an exciting selection of colours, from the commonly-used white, to yellow, red, blue, and green. Unlike the stainless steel marker, WMTB HF is printed using thermal transfer technology. Other than the marking materials, Phoenix Contact also offers UV-resistant cable ties that work with the markers, as well as high quality printers with laser and thermal transfer technology. Please feel free to contact the Phoenix Contact sales team if you wish to know more about these products. Today, we enjoy the fruit of technology as we turn on our television, air-conditioner, lights or our smart devices. Have we thought about what are the nitty-gritty details that have led to our enjoyment in this day and age? What is common amongst all this technology is the need for electricity, and more importantly, what carries electricity around are wires. Wires and cables are the root that carries electricity all round; it allows current to flow from one point to another. What is often missed out is the hard work spent by the electricians who, behind the scenes, manages this labyrinth of wires. Cutting, Stripping and Crimping are steps that are very familiar to our electricians. However, they are not just merely steps; but in fact, they are techniques that we need to offer much respect to the electricians who handle them. Providing the right tools for the job makes it even more crucial to ensure they put their techniques into the right place. Cutting, Stripping and Crimping of wires sound easy and effortless. However, using it on a daily basis requires the tool to be designed more than just a normal tool. Phoenix Contact takes ergonomics, usability into consideration and provides the optimal tools for its end users. Safety is a true concern in a workplace, and every effort to keep the workplace safe is extremely important. Slip guards are attached in our cutter which keeps the blades closed. Spring-loaded pliers opens up automatically, which means users spend lesser energy. With the pivot near the cutting edge, it provides optimum power transfer. Cut your wires perfectly with the special curved metal giving your wires a nice and squeeze-free cut. The steel material of the cutter has gone through heat and surface treatment ensuring your tool to be long lasting and corrosion resistant. Consisting of both soft and hard parts, meant for the best comfort for any hands. The curved designed of the handles and the angled head for the ultimate ergonomics. Depth of the blades can be easily adjusted as required. Length of the stripped length can also be easily adjusted with the small measurement ruler and the stopper in place. Interchangeable knife cassette gives you the option for all different wire sizes as required. One casing for all wire sizes! A wire stopper equipped in the knife cassette helps you to position your wire at the stripping length you need. Equipped with a cutter at the side, it gives you the convenience to cut your wires any time. Consisting of both soft and hard parts, meant for the best comfort for any hands. The curved designed of the handles and the angled head meant for the best stripping experience. Self-adjusting principals of the die covers a large cross section (0,14 – 6mm²), so you can use one tool for most of your needs. Built in ratchet mechanism is the key for a good crimp as it doesn’t allow the pliers to open until the process is complete. In this way, it ensures a proper and complete crimp. Due to the special die closing process and its ball bearings, it reduces wearing out. Thus, eliminating the time and effort you need for re-calibration. Equipped with a rotating crimp mechanism, together with the tool size, ensures an optimum power transmission. In other words, you use less energy! Consisting of both soft and hard parts, meant for the best comfort for any hands. Its small size of 18cm tall, 6.5cm wide, and weighing at 380g serves as a compact and handy tool. The optimal positioning of the pivots gives the smallest opening handle angle in the market. Not forgetting the soft non-slip pressure pad supports your force transmission, so you can, for example, have it sit against a table surface! After introducing the key features and ergonomically designs of our Phoenix Contact tools, would you like to experience it first hand on its comfort and ease of usage? Get a “Cut, Strip & Crimp” Toolset kit today with our current promotion in Phoenix Contact! For more information on the promotion, just leave us your contact and we will get back to you soon. I would like to know more about the Toolkit Promotion from Phoenix Contact. Please contact me. Some call it marking, others call it printing. At the end of the day, we require objects in our lives to be labelled, just like how every of us have a name or identification number. Before I joined Phoenix Contact 2 years ago, never did I know that Phoenix Contact offers such a wide range of marking possibilities! Our range of Thermal Transfer printers include Thermomark Roll, Thermomark Card, Thermomark Prime, and Thermofox. This printing technology allows affording cost of printing, but yet allows text, graphics, batch numbers, and bar codes to be printed. Being economical and flexible, our Thermal Transfer printers allow users to do either batch printings, as well as continuous printings without wastage of materials! 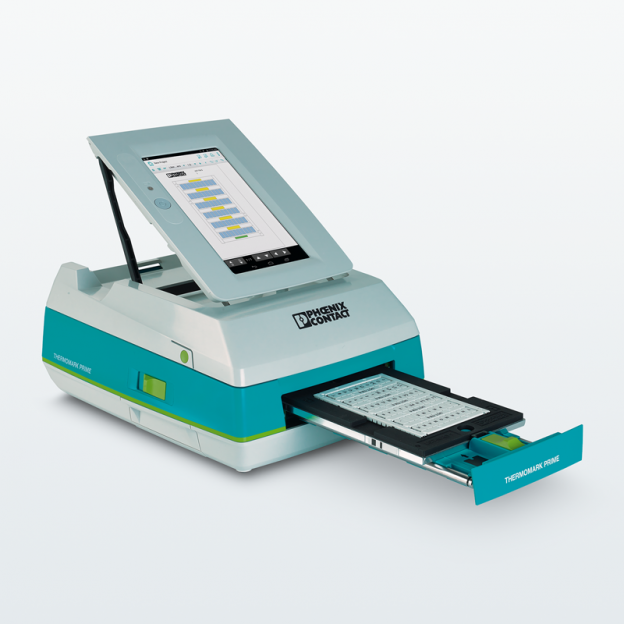 LED-UV: A revolutionary technology which is used in our Bluemark CLED printers. Not only does this marking system prints on plastic, it prints to aluminium too! The UV light will cure the ink and bond it to the material to ensure high resistance levels in various environments. The current markers allow marking of conductors, cables, and systems, covering the entire field of device and system marking! Laser: Another groundbreaking marking system which uses a top class ytterbium fibre laser to mark on more than 400 different markers, ranging from stainless steel to aluminium to plastic. No ink or toner will be required due to the fact that the laser marks directly onto the marker material. Therefore, the resistance level of the markings are able to withstand the harshest environments and conditions, as long as the base material lasts! Just a single, free, software is required to design and send print jobs to Phoenix Contact’s range of printers. CLIP PROJECT has more functions that you can imagine, it even allows data to be automatically imported from Databases straight to prints. CLIP PROJECT and Eplan have been partners for quite some time, and this means that users can seamlessly allow direct printing in CLIP PROJECT straight from Eplan schematic. The CLIP PROJECT planning and marking software is all you need, and you may find more information of this software here. Yes, it is free to download and free to use: No need to worry about having dongles for every computer, or annually paid subscriptions! The handy THERMOFOX thermal transfer printer marks labels, signs, and shrink sleeves supplied in rolls directly on-site, and can be used in all areas of industrial marking.